AnnaMaria Windisch-Hunt is our first featured artist in the Limelight. An experienced arts advocate, she successfully owned and operated Gallery Vincent and Windisch-Hunt Fine Art Gallery in Coconut Grove, Miami. Recently closing Windisch- Hunt to explore new territory, AnnaMaria and her husband had researched artist's communities in Florida for several years before making the move to Lake Worth. Founder of the One Ear Society in Coconut Grove, AnnaMaria devotes herself exclusively to artistic activities. Her passions include curating and organizing over 200 juried exhibitions. Meeting her husband Fred Hunt while promoting an art show on Miami Beach, AnnaMaria believes that it was serendipity. According to Fred and the many artists she championed, she is their muse. Artist books and written words are important in her daily work. Creating a very successful blog www.lakewortheveryminute.wordpress.com she reveals an artist eye at work. 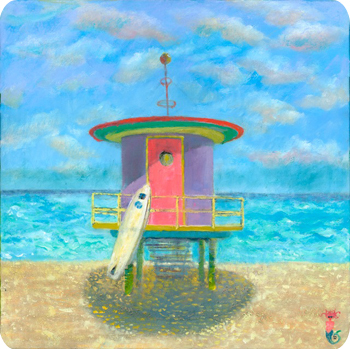 Being a trained painter from John Herron Art School, she painted a series of lifeguard stands for the City of Miami Beach (pictured) and was honored to receive a key to the City. AnnaMaria enjoys teaching and has taught classes at Bass Museum of Art and is a participating member of the Key West Cultural Consortium.